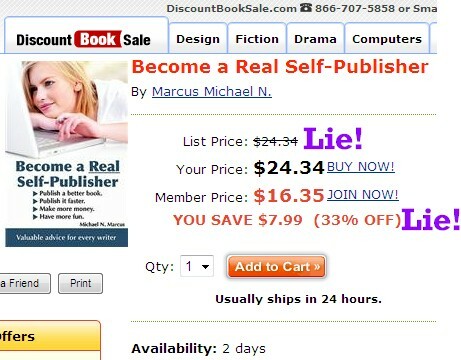 Sleazy bookseller DiscountBookSale.com has just added my new book, Become a Real Self-Publisher, to their website. The book's real cover price is $19.95, and both Amazon and Barnes & Noble discount it to $17.95. However, they will discount the book to an Amazon-beating $16.35 (falsely claiming it's a discount of $7.99/33%) for their BestBrandValues club members. To join the club, you pay a "low $19.95 membership fee per month" -- nearly $240 per year! You'll have to buy an awful lot of books before the $240 covers the $1.60 difference between their price and Amazon's price. And strangely, the company claims both "Usually ships in 24 hours" and "Availability: 2 days." Also strangely, the company has assigned the book a rating of 4-1/2 stars out of five, with absolutely no explanation of their rating system, or any posted reviews from readers. They also lie about the cover prices and discounts for three other books I published. There are many online complaints about this company, particularly from people who joined the expensive club without realizing it when they made a purchase. Nobody needs DiscountBookSale. There are plenty of other booksellers around. This company should be shut down.